The popularity of the Ventrino Exchange continues to outgrow its competitors at an unbeatable pace. 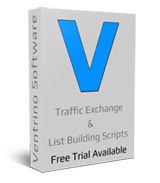 With it's ease of use for member and owner alike it's easy to understand why a Ventrino script generates more revenue than any other. This is not a get rich scheme, with the right script, the right features and the right support there is no reason why you cannot be in profit within a very short period. Don't get caught by an easy trick used by other unscrupulous vendors. �If they do not link to a place where you can actually contact the person who provided the testimonial then it is probably fake.. Whether you have a few hundred or a few hundred thousand members the Ventrino script is ideal and robust.